The Greater Swiss Mountain Dog is considered one of Switzerland’s oldest and largest of the four Swiss variety dog breeds. It is thought that they are descended from the large Mastiff-like dog called the Molossus, a type of Mastiff used in the Roman Colosseums. These dogs were brought to the Alps by invading Romans. Farmers loved these dogs, and they served as draft, guard, and herding dogs. They were often used by butchers as draft dogs, pulling produce and meat to the market. The dogs worked as hard as horses but didn’t eat as much, and their litters were huge – sometimes up to 18 pups! At that time the Greater Swiss Mountain Dog was known as “Old Blaze.” The Swissy teetered on the edge of extinction at the beginning of the twentieth century. During World War II, when the dog was used as a draft animal by the Swiss army, there were fewer than 400. Since then, however, careful breeding has steadily increased their numbers. 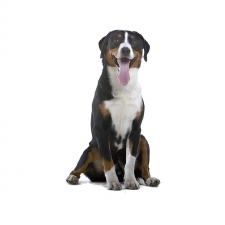 The Swissy is a happy breed who loves people and craves physical contact and attention. They have strong personalities and need a master with strong leadership skills. These dogs are happiest when they have a job to do. They enjoy walking, hiking, backpacking, weight pulling, swimming, and carting. The Greater Swiss Mountain Dog makes an excellent watchdog. They look intimidating, and they are naturally alert, aware, and protective. They tend to be aware of their surroundings and will sound the alarm if they sense anything is different. These dogs are incredibly social animals and are kind, sensitive and want to be a member of your family, striving hard to please. They thrive on attention and praise. They like to play and are known to be gentle with children. These dogs make excellent family pets as they are friendly, faithful, loving, and obedient. They are just like the Swiss people, calm, even-tempered, and sturdy. The Greater Swiss Mountain Dog usually weighs approximately 85 to 140 pounds and stands approximately 24 to 29 inches tall. They are a large dog with a powerful build. They have a short coat that is usually tri-color. In the 1800s, the Swissy started to disappear as the popularity of the red & white St. Bernard soared in popularity. There were many cross-breedings, and the dog with the dominant red and white was call the St. Bernard. Many Greater Swiss Mountain Dogs became St. Bernards in one generation. At the turn of the century, only a few remained on isolated farms, but thanks to Franz Schertenleib and Dr. Albert Heim, the breed was revitalized.